Kayak design and technique have been brought to a high art in the Arctic, where a mistake is likely to be fatal. Sea kayakers in Europe and the USA are increasingly interested in the traditional approach. We look at this in various places on the Kayarchy website - see the links on the right. For an excellent resource on all things about Greenland kayaking, see www.qajaqusa.org and click here for additional links. 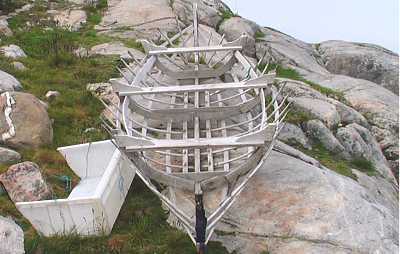 Modern recreational sea kayaks probably owe most to West Greenland design. And to how few designers... even today, the total population of Greenland is only 57,000. In his book Watkins Last Expedition (Chatto & Windus 1934), F Spencer Chapman noted that his friend Kidarsi "although an excellent wood-worker, is getting his uncle to make his new kayak: so specialised is the construction that the good hunters prefer to get their kayaks made by one of half-a-dozen noted experts". According to the Greenland Tourism & Business Council / Greenland Home Rule / Nanoq at www.greenland.com "the kayak... is almost 4000 years old... [and] has been an essential piece of hunting equipment for Inuits in Greenland and the rest of Arctic North America. 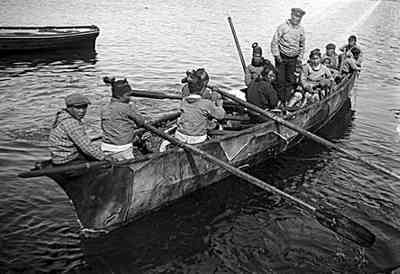 The kayak has been used in connection with sealing, whaling and fishing...the traditional 'qajaq' is still seen in many towns and especially at the annual kayak meetings, but for recreational kayaking the more robust sea kayaks made of fibreglass have gradually taken the place of the traditional versions." The Norse certainly had canoes of their own design, little double-ended wooden open boats. 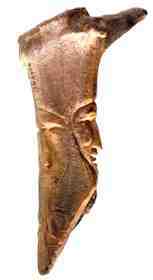 In about 900 AD an aristocratic Swedish lady was buried at Årby Gård, a farm near Uppsala, with a small canoe. At 3.95 metres by 1.05 m (13 feet by 41 inches) it had both paddles and oars, and a movable seat to give comfortable sitting positions for paddling or rowing. If a faering (four-oared boat) is a miniature Viking longship / drakkar, the Årby boat is a miniature faering. Several museum replicas have been built by specialist craftsmen from oak planks bent and cut to the right curve. If you want to try yourself, the lines are available in several places on the internet. The original had only two wide planks per side, plus a narrow horizontal plank for the bottom. If you want to build a plywood reinterpretation, you could get a similar shape and appearance if you're willing to make the planks narrower. Try a Google image search on "Årbybåten". The homeland of the Vikings was, of course, Scandinavia. They saw themselves primarily as farmers. By 870 AD, population pressure in Scandinavia was sending Norse settlers west to Iceland. By 930, Iceland itself had little room for new settlers. Certainly by the 980s all the worthwhile farmland had been carved up, leaving the less fortunate to work as tenant farmers or labourers. In 982 a frustrated Norseman, Erik the Red, was looking for new horizons. He had been banished from Norway for unacceptable violence and got into more trouble in Iceland. Having heard that a land existed west of Iceland, he sailed there with his family and followers. The main Viking settlement was near Erik's own farm of Brattahlid at the inner end of Eriksfjord in the south west of Greenland. His wife Thjodhild caused him to build a small Christian church there. Substantial other settlements were set up at the inner end of fjords near what is now Nuuk. The first was captured while still seated in his kayak. He died of a chest infection within two weeks of arriving in London but not before being painted in watercolour by the Flemish artist Lucas de Heere. 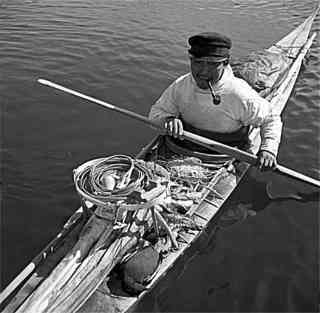 He is shown here wearing a tuiliq, with paddle, bow and arrow and a kayak in the background. In Africans & Native Americans (University of Illinois Press) Jack Forbes states that "by 1566 Inuit people could be seen in the Hague... the massive growth of the whaling industry as well as the activities of the Danish government led to many Inuit along with their kayaks being taken to Europe, principally to Denmark, the Netherlands and whaling centres.... 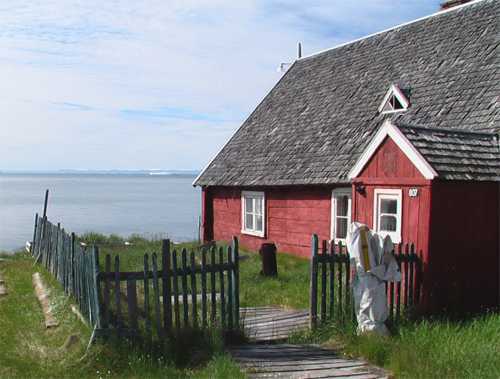 Between 1605 and 1725 quite a number of Inuit were taken specifically to Denmark, Holland and Friesland. From these places a number managed to escape in their kayaks."